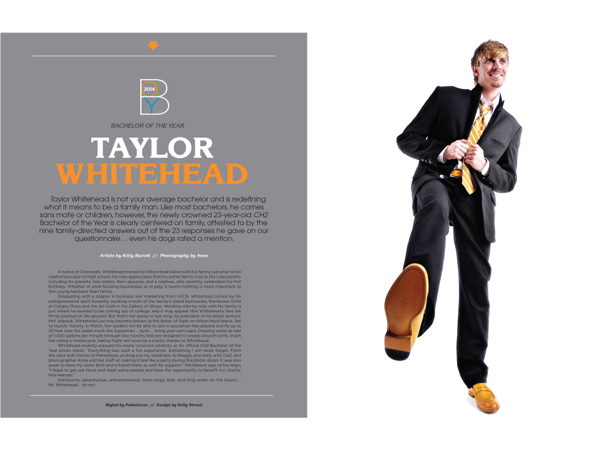 Taylor Whitehead is not your average bachelor and is redefining what it means to be a family man. Like most bachelors, he comes sans mate or children, however, the newly crowned 23-year-old CH2 Bachelor of the Year is clearly centered on family, attested to by the nine family-directed answers out of the 23 responses he gave on our questionnaire… even his dogs rated a mention. A native of Cincinnati, Whitehead moved to Hilton Head Island with his family just prior to his sophomore year of high school. He now appreciates that his entire family lives in the Lowcountry, including his parents, two sisters, their spouses, and a nephew, who recently celebrated his first birthday. Whether at work building businesses or at play, it seems nothing is more important to this young bachelor than family. Graduating with a degree in business and marketing from USCB, Whitehead comes by his entrepreneurial spirit honestly, working in both of the family’s island businesses, Bomboras Grille at Coligny Plaza and the Art Café in the Gallery of Shops. Working side-by-side with his family is just where he wanted to be coming out of college, and it may appear that Whitehead’s feet are firmly planted on the ground. But that’s not going to last long. As president of his latest venture, HHI Jetpack, Whitehead just may become known as the father of flight on Hilton Head Island. Set to launch, literally, in March, fun-seekers will be able to don a spaceman-like jetpack and fly up to 30 feet over the water much like Superman … byoc … bring your own cape. Drawing water at rate of 1,000 gallons per minute through two nozzles that are designed to create smooth turns, much like riding a motorcycle, taking flight will soon be a reality, thanks to Whitehead. 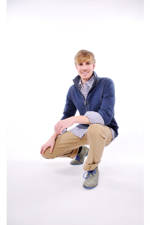 Handsome, adventurous, entrepreneurial, loves dogs, kids, and long walks on the beach … Mr. Whitehead… oh my! I FEEL MOST SATISFIED… When I am around my family and friends. IF I WON THE LOTTERY I WOULD… Support my family and donate to charities. I would then want to travel to different parts of the world. IF I COULD GO ANY PLACE IN THE WORLD… I would really like to go to Italy. I think it would be really fun to experience Italy and to learn their culture. I MOST ADMIRE… My father. He has taught me a lot throughout my life and has helped me become who I am today. I envy his work ethic and love for his family and friends. WHEN I’M NOT WORKING.. I spend a lot of my time hanging out with family and friends. I LEAST LIKE… Being non-active. I always have to be doing something. MY CAREER GOALS ARE… Creating successful businesses and to take a company public. IN FIVE YEARS I SEE MYSELF… My five-year plan is to meet the right girl and eventually start a family. From a professional standpoint, I’m in the process of starting a business and would like to see it successful over the next five years on Hilton Head Island as well as other sites. THE SMARTEST THING I’VE EVER DONE… Graduate college with a business degree. ADVICE I’VE GOTTEN SINCE BECOMING BACHELOR OF THE YEAR… Be myself and to not let it go to my head. I TEND TO FOLLOW MY HEAD/HEART… I would follow my heart, which would lead my head in the right direction. THE BRAVEST THING I’VE EVER DONE… I got into the CH2 Bachelor contest. That is brave right? WHEN I’M BORED I… Do a lot of random things like visit friends, watch movies, and hit golf balls. I THINK IT’S ROMANTIC TO… Take a nice walk on the beach with a close female friend, drinking a glass of good wine. SPENDING TIME WITH FAMILY… I spend time daily working for our family businesses at the Art Café, Bomboras Grille, and now with the upcoming HHI Jetpack. I am very fortunate that my whole family lives here on Hilton Head. THREE WORDS THAT DESCRIBE ME ARE… That is a tough one. I would probably say generous, ambitious, and caring. WHAT REALLY MAKES ME LAUGH is… Watching my one-year-old nephew Breckin. ANIMALS I LOVE… Two dogs named Macallan, a Westie, and Picabo, a Lhasa-poo. BOOKS OR MOVIES? I prefer watching movies. I like a lot of comedies and action movies. It’s hard to pick out a favorite. IF I COULD ONLY HAVE ONE JOB FOR THE REST OF MY LIFE, I WOULD… Do anything as long as I’m surrounded by the ones I love. HOW I WILL SPEND MY WINNINGS… I will be donating all of the winnings to the charity called Hire Heroes. It’s a not-for-profit organization that is dedicated to creating training and new job opportunities for veterans and their spouses. I have played in golf tournaments put on for this charity numerous times and have met amazing veterans who have fought for our country. THE JOB I AM DOING RIGHT NOW… I am starting a business that is set to launch in March. It is called HHI Jetpack. Check out http://www.youtube.com/watch?v=s00SwPZ_1D0 to get an idea of what it’s all about. MY SUPER POWER WOULD BE… Flying. Wait…..I can do that with my HHI Jetpack. Getting to Know Myself:Personality quizzes a gateway to world peace?